Queen Eadgyth (pronounced Edith) was the granddaughter of Alfred the Great. Her half-brother Athelstan unified disparate Saxon and Celtic kingdoms and is thus considered the first king of England. When Eadgyth was 19, Athelstan sent her and her half-sister Algiva or Adiva to Germany, telling the then Duke of Saxony to pick the one he liked best. Eadgyth was said to the prettiest and the Duke married her in 929 A.D.
That Duke later became Otto I, Holy Roman Emperor. 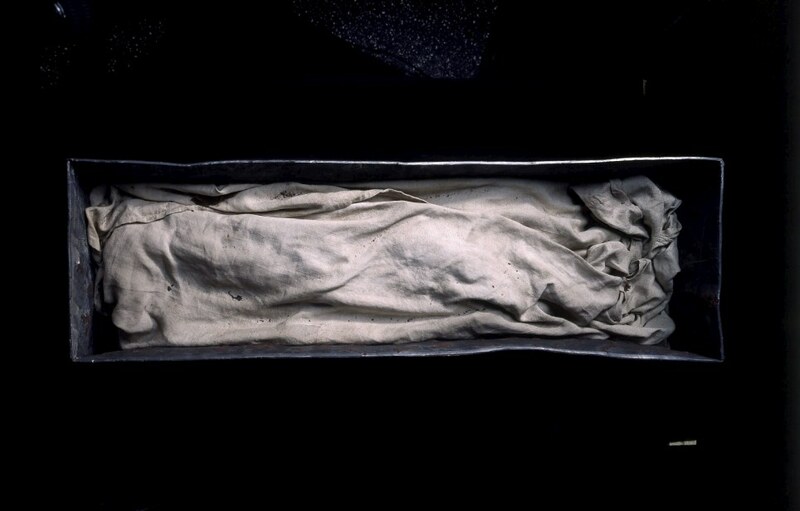 Eadgyth bore him two children and died at the young age of 36 in 946 A.D. She was buried in the Cathedral of Magdeburg. Otto died 26 years later in 973 and although he had remarried after her death, he chose to be buried next to Eadgyth in Magdeburg. Their remains didn’t stay put. Over the years they were moved several times, the last time in 1510 when the fancy cenotaph was erected in the Cathedral. 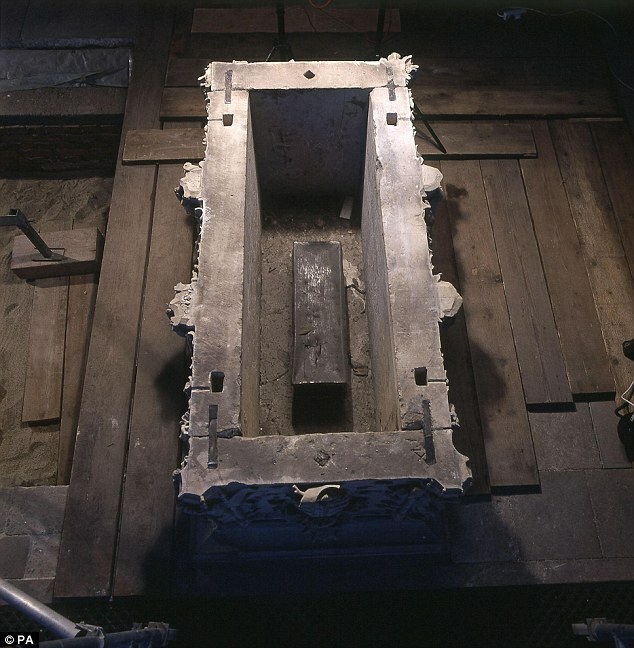 People thought that it was just a marker, not the actual location of her bones, so when archaeologists researching the cathedral opened the vault they were shocked to find a lead coffin marked with Queen Eadgyth’s name and the 1510 date. Inside they found a skeleton wrapped in silk. The bones belong to a woman between the ages of 30 and 40. That’s not final confirmation that the bones belong to Queen Eadgyth, of course. We’ll have to wait for the results of chemical analysis to know for sure. In particular they will try to match radioactive isotopes embedded in the bones to those found in her birthplace in England. Professor Mark Horton, of the Department of Archaeology and Anthropology, who is co-ordinating the research, said: “We know that Saxon royalty moved around quite a lot, and we hope to match the isotope results with known locations around Wessex and Mercia, where she could have spent her childhood. No earlier remains of an English royal are extant. Her brother Athelstan’s tomb is still extant in Malmesbury Abbey, Wiltshire, but archaeologists think it’s empty. This entry was posted on Wednesday, January 20th, 2010 at 10:30 PM	and is filed under Medieval, Treasures. You can follow any responses to this entry through the RSS 2.0 feed. You can skip to the end and leave a response. Pinging is currently not allowed. So King Alfred entered the gene-pool of Continental royalty thusly – so are there modern descendants? The Hapsburgs perhaps, who seem to be related to absolutely everybody? Yessir. Otto I is related to ever German royal family that came after him, including the Hapsburgs, Hohenzollerns and Hohenstauffens, all through Eagdyth’s (and therefore Alfred’s) line. “Thusly” ??? or “thuswise” Alfred would have been shocked. Between Alfred and Victoria, pretty much all the royals in Europe are some form of cousin. Not to be trite, but “royal” DNA is actually pretty common in Eureope. Just do the math by generations. This doesn’t even count the bastards in the lineage. It still fascinates the hell out of me. Yes, at least one of our neighbours might be a king’s descendant. Actually, according to one of my crazy great-aunts, we’re descended from some English King’s whore. So yeah, not terribly impressive. Actually, the great hoopla they’re making over this (while it is cool) sort of made me smile. Mostly, they are so excessively excited, as I understand it, because this would theoretically be the first (mostly) intact skeleton of that period. However, they are (as far as I know) 95% sure that Alfred the Great’s body was buried in Glastonbury cathedral. The kicker, is that they’ve forgotten where in the floor they put him. Now since the cathedral itself is no longer intact, and damaging it by excavating wouldn’t be an issue – I can’t for the life of me understand why some poor fool doesn’t just go get a metal detector and FIND it. The space is not that big for god’s sake. They’d have an even older, even cooler, skeleton on their hands. Oh way cooler. Alfred was 6’4″! He’s still the tallest king England has ever had. Do they think maybe the bones were destroyed/hidden/messed with during the destruction of the monasteries? That’s why they think Athelstan’s tomb is empty. That would make sense, and to be honest I have to say I don’t know. But my IMPRESSION is that he was buried under the floor at some point long before the dissolution and therefore wouldn’t have been damaged by the destruction of the cathedral. Similarly, though on a slightly fantastic note, (during it’s physical existence) the cathedral boasted of having the bones of Guinevere and King Arthur. There was a very large tomb built for them which WAS destroyed during the dissolution, but unless I’m mistaken, the pair of bones are now buried in a marked spot in the cathedral ground. Our conversation intrigued me and so I did some looking around. 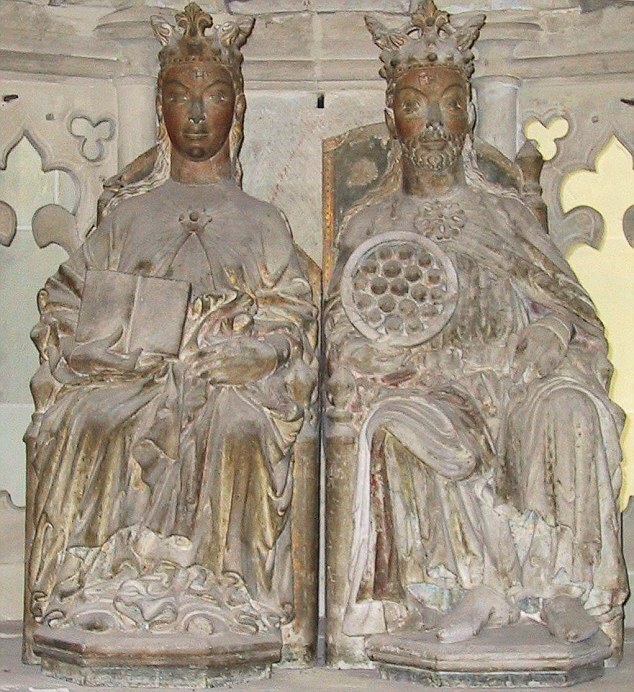 It appears I was either misinformed or misheard – the English king at Glastonbury was Edgar I, a later descendant of Alfred (which would make Eadgyth the earliest). Ah, fascinating. Thank you for following up. What a shame there are no giant Alfred bones to gawk at.